How many more Big Muffs do we need? Well, if you ask me I say keep â€˜em coming! One of the latest additions comes from Buffalo Effects – a clone of the monstrous mid 70s ramâ€™s head sporting NOS BC239c transistors. Well worth checking out, donâ€™t you think? Hereâ€™s my review. 12-13 years ago, the Big Muff was all but extinct. Now everyone seems to offer at least one in their portfolio of pedals. Interestingly though, few have tackled the authentic nature and sound of the classic ramâ€™s head, which Iâ€™ve missed, being a ramâ€™s head fan my self! The Buffalo Ramâ€™s Head is about the size of an MXR but almost twice as high. Perhaps not the most appealing pedal Iâ€™ve come across but then again, itâ€™s whatâ€™s inside that count. Anyway, the pedal feature the familiar tone, gain and volume controls, a stage ready led, true bypass switching and an easy access battery compartment on the side of the pedal. More interestingly the Ramâ€™s Head feature NOS BC239c transistors. 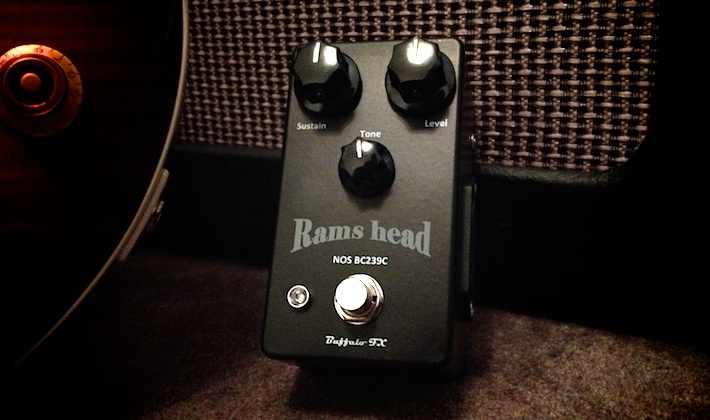 The 70s ramâ€™s head Big Muff is known for its high gain character, bright cripsy top and silky smooth sustain. The Buffalo Ramâ€™s Head is no doubt in that same category but compared to most ramâ€™s heads it has a bit more low end and mid range, giving the pedal a slightly darker character and a nice hint of compression. Make no mistake though, this one angry beast perhaps best described as a mix between a brighter sounding ramâ€™s head like the Pig Hoof and a darker more middy Sovtek. You might find that itâ€™s just a bit too dark sounding on some amps and I havenâ€™t quite been able to make it work with humbuckers but the fact that it has a more mid range than usual, makes it a great alternative for your low volume bedroom setup and brighter sounding amps. The Buffalo Ramâ€™s Head covers Gilmourâ€™s classic Big Muff tones from Animals, Wall, Final Cut and On an Island/Gdansk and it does a pretty good job covering the PUSLE era as well. I prefer having a transparent booster after it for tightening up the frequencies but it stands well on its own too – especially if you crank the volume control up to 3-4 o’clock for that tube amp feeling. Related features: The Buyerâ€™s Gear Guide Big Muffs, Big Muff tone tutorial and Comfortably Numb tone tutorial. Hi bjorn, is the Buffalo FX Ram’s Head NOS BC239c is the same as thr M1 Stacked Ram’s Head ? No. The BC239 was a take on the Ram’s Head, while the M1 is sort of what you get from stacking a RH and Powerbooster. They’re obviously both Muffs but very different sounding within that range. Absolutely insightful review Bjorn, appreciate it very much! You have the picture of RH Rams Head, but your link reviews the Rams Head both with NOS BC239c transistors. Any main characteristics differences between the two and which one you like better, why? This an older review of the first incarnation of that pedal and I’m not sure if it’s still available. Check out their M-1, which I’ve reviewed here. Thanks for your time Bjorn! Hi.Bjorn! Great rewiew! Between buffalo and vick audio ram’s head what’s different? Do you prefer buffalo or vick with emg dg20? The Buffalo is out of production. They’ve released the M-1 Fuzz, which is a Ram’s Head but with a bass and treble tone stack rather than the usual single tone. The Vick is perhaps more saturated and brighter sounding but it’s got the 3-way mid range option, which makes it very versatile. The M-1 is perhaps a bit more vintage sounding but they both nail that classic tone. Bjorn Hello, Why was the NOS discontinued? I actually think it sounds better than the M1 for DG tone. Hello, Why was this discontinued? I like the sound from your videos and must say the tone sound better than the M1. What is the difference as far as you know? Well, you have to ask Buffalo why it’s no longer being made but the M1 has a two band EQ, which makes it much more versatile than the previous model. Overall, I think the M1 sounds better too. More authentic towards the Ram’s Head and not as dark as the BC239c. Ive got the Patriot form Buffalo FX and thinking of getting this one. I also play on a Hiwatt little d rig, do you think i should get this pedal or…. what muff would you recommend? The Little D, and Hiwatts in general, can handle pretty much any Muff you throw at it, so it comes down to what type of Muff you prefer. Hi there, how would a pedal like this work on a Roland cube with a fender Classic strat? Can you make some recommendations to get nice overdrive/fuzz tones on this sort of rig? Thanks! I have very little experience with the Cube but in general I would’t recommend a Muff. They often sound harsh and thin on smaller transistor amps. I would go for something a bit more versatile, like the Buffalo TDX or Evolution. These have more compression and mid range, which will work nicely on most amps. Hey Bjorn… Thanks for all that you do. I’ve read all your blogs and I’ve noticed that you like a “transparent” booster after most Muffs. In the past, I’ve always run Muffs and Si based Fuzz through a gain pedal to “round” the sound a bit. I have used the BFX 18V Booster before the RH-X and it make it come alive. I never tried it after until recently and I now understand why you like it. I accidentally ran a Si Fuzz through the EP booster and I was plesently surprised with the resulting tone. EP is not transparent per se. However, it works well after Fuzz pedals. So, I tried RH-X with EP after it and it really sounds smooth. Have you ever tried this combination? I’m now running BFX 18V Booster before RH-X and EP after it. I haven’t used the EP much but I’m mostly combining my Muffs with a TopTone Shine Boost, which has that same slight mids boost as well as the volume boost. Works very well. Hi Bjorn, since the review was done a while ago I thought I check with you about the muff sound with a lot of sustain but being quiet at the same time. Something suitable for moderate levels on Laney Cub for bedroom levels. My black box EHX Sovtek muff just has a lot of noise and muddy low end. I like something with more articulated sound and definition and more mid-range and high end expression. Thanks Bjorn. I checked Muffuletta. The idea is great but I should try it myself to see if I can get more singing mid-range out of that in a less compressed setting. I think the sustain they use in the demos are just too high for DG stuff. I found Vick Audio 73 is the closest to what I like to have. I use a TC Electronic Nova Drive to make a more mid range band EQ and a touch of overdrive with mix knob set to make it more melodic without compressing it further. Sort of like a booster in downstream, then I do the final EQ with GE-7 downstream of my plexi-drive at the end of the signal chain. I just got a late 60s / early 70s Fane speaker and I have to constantly tweak the EQ beyond what I got used to for my sort of flatter in high-mid frequency Celestion. I think a tube driver would tame the sound instead of the plexidrive. I will know in near future. Hi Bjorn, thank you for one of the most entertaining sites on the internet! It would have been so nice to see your gig tonight. The record is 10/10. Based on your review and Youtube video about the Buffalo Ram’s head, I sold Triangle Beaver and ordered one of these. Even though Beaver already was perfect! What would you recommend as solo modulation with this pedal in a situation where Boss pedals are not an option. I’m looking for sweet liquidy/watery tone. I own similiar Mistress as you already + vibe. PS. It’s the size and the buffer with RT20, I don’t appreciate. The set up is sooo punchy now. ElecLady has been teasing me after seeing your comparison video. Although, it seems like there is a little extra something with the real deal. The space saving would be tempting, though. Today, on rehearsals I tried the Mistress with faster settings and knobs with different positions – pretty convincing leslie sounds! For the liquid leads, I sometimes find it a bit too overwhelming, depending hugely on which distortion/fuzz in use. Sunface108 tends to be a tricky partner for it. I’m not too big a fan of choruses but maybe should give one a shot! Also maybe on mix pedal for the modulation could solve this problem. The ElecLady is definitely worth a try. It’s perhaps a tad less dominating as well. Excellent write up my man. All very much appreciated on many levels. In your opinion which Muff would be best suited for a ’78 twin/ultralinear amp? Thinking very dark Muff suggestions cor this super bright for days amp. Also are humbuckers totally out of the picture? Thanks again Bjorn. You rock! Cheers, Chris! For Fender I’d go for a Sovtek or a clone. The current EHX Bass Muff XO should go nicely. Also, the Buffalo Patriot or Wren and Cuff Box of War… or similar. I’m planning on getting my Big Muff (finally! ), but the problem is this; since you’ve reviewed so many different models that all seem to offer something unique and different, you’re making it quite hard to choose :D but I’ve managed to cut it down to three; Pig Hoof (both red and yellow label) and Buffalo FX Ram’s head. Could you give me your opinion on which one of those works really good for recording and on stage. I’m playing a MIJ 62′ reissue Strat with CS 69 neck and middle and D.Allen Echoes bridge through Classic 30. I’m considering adding a Buffalo Powerbooster to use with my Buffalo Rams Head, so is the Powerbooster placed after the Rams Head before the likes of a Delay pedal etc? Does the Powerbooster introduce any more ‘noise’ using both together? What would the settings be on the Powerbooster for the likes of Comfortably Numb for playing at bedroom level? Surely you wouldn’t use the drive knob would you?, as wouldn’t you want a clean boost only for the Rams Head? I’m interested to know the settings how you use both together as I do find the RAMS head just a tad “Dark” & wondering if I might get the boost I need at bedroom levels with introducing the Powerbooster! Hello Bjorn. I hope all is well by you. I just ordered the Nano Bass Big Muff Pi as you recommended as I was looking for a small, inexpensive, huge sounding big muff. I appreciate you steering me towards it as it wasn’t on my radar. Plus I got a great deal from Prymaxe Vintage on an already inexpensive pedal. My question to you is whether you think this pedal would benefit from any kind of booster/overdrive after it, or should I leave it a la carte? :) Thanks Bjorn! I’m looking for a Rams Head that will suit my setup, cause I really don’t like the little muff for… anything really. I have a Laney Lionheart 20w combo, and as you know, it’s not exactly a bright sounding amp. In the review, you say that the Buffalo Rams head sounds too dark on some amps, and I’m afraid maybe it will sound too dark on my setup if i bought it. Which pedal would you recommend to nail the 1977-83 tones? Another excelent review, thanks for it !!!! and Amazing playing you really make sound pedals at its full potential. Hi Bjorn!I m doutbting between buying the red muck or rams head?Which you prefer for tones of Pulse? Do you know won the Buffalo FX Rams Head and Powerbooster, because I’m not sure as to where i can find out who won? Thanks to you for this review ! I didn’t know Buffalo Fx before but those pedals are really impressive. I don’t have a long experience with muffs but this one has lots of room, sounds great and edgy… It also works very well with EMG p-ups and is very versatile. I like the black and neat sober look too !!! just bought this muff…sounds huge! Which clean boost do you raccomend for bedroom levels with a Fender BJ III? and many thanks for your hard work. Have you ever tried the Buffalo 18v Powerbooster. Hi Bjorn, great review! the Buffalo Rams Head sounds so awesome and Brett Kingmanâ€™s video certainly is impressive as well! Brett certainly raves about it being probably the best he’s ever heard! How does this compare do you think with the Wampler Velvet Fuzz? 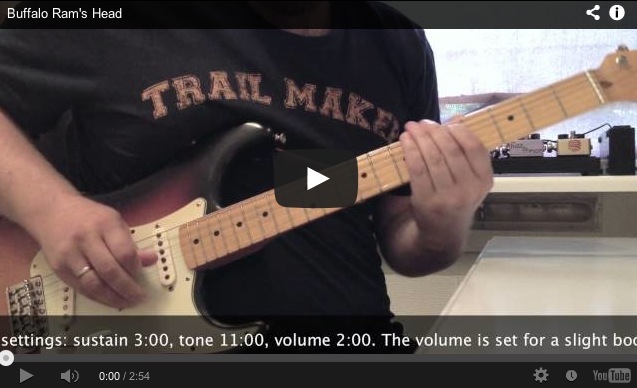 The lead tones video by Andy from ProGuitarShop of the Wampler seems pretty reasonable as well…PGS are the retail seller of course! Hello again Bjorn, thanks for your recomendations on the Strats!! but now i have a doubt about something. when you claim that “A good tip is to use modulations with care. Unlike overdrive, distortion and delay, a chorus or flanger can sound very dated and out of place if you use them too much or for the wrong reasons. All modulation effects sounds best if you use them for specific stuff and even better, to create unique tones that defines your sound and playing.” You mean that the sound starts getting annoying, or that the pedal gets damaged?? thanks!!! hi Bjorn! great news, i spent on a “mint condition” vintage Deluxe Electric Mistress. im very happy but, I recently read your “tip of the week” about recreating rotary speakers. so i was trying to recreate the most close as posible sound of the Studio version of Dogs. but since the flanger was not used on the album, and the yamaha rotary speaker did… which setting i have to dial in my electric mistress to achieve a close sound?? thanks!! hello Bjorn this is my first comment on your site. i was thinking to make my biggest investment, a fender stratocaster. so i decided to take in the Mex fenders since im a budget one haha, so i wanted to ask you: i saw the fenders Classic Series 50Â´s and 70Â´s. which one of them would you pick. im new in this so i dont see any major differences, which differences do you see?? which guitar do you recommend me the 50Â´s maple neck or the 70Â´s maple neck model?? by the way LOVE YOU SITE!! Full of great info!! thanks for listening me! Bjorn sorry to bother you, about the fuzz faces, i have a question. which one of these “fuzzes” would you choose for pompeii and Dark side tones (i dont think fuzz was used on the Wish you were here album) ?? the Zvex fuzz factory or the Dunlop jimi hendrix fuzz (bc108)?? thanks like always!! Another excelent review. GAS!! Amazing playing as usual. Do you remember the specs of your Warmoth Neck (Nut Width, Back Contour, Fingerboard Radius and Fret Size)? Is it a Vintage Modern or Total Vintage construction? Love your beard,BjÃ¶rn! Going for a Gilmour 1977 look? :) Oh, and great sounding pedal also. Again I want to thank you for the Reviews. Recently I bought RedMuck… This is my first vintage Muff))) I am very pleased with the pedal, because I can compare it with the modern EX Pi. RedMuck does not lose its charm at low volume. And with chorus the Pulse magic begins! In my humble opinion Buffalo Ram’s Head too oversaturated. Do you think there is a worthy sample in the fuzz/muff market? Wow, your playing is so accurately, and the pedal sounds huge. In 3 weeks my internship in Oslo begins, and I will take with me a Strat, a Laney Cub, the PC2A, the Replica Delay and maybe that RAMS HEAD clone. Thanks to you I got to know that before my journey begins ! Greetings from Germany ! I know you just posted this but I have to ask what is the Gilmourish score? Would it work at bedroom levels with a Laney Cub? Are they going to be limited? i’m sure you are posting it soon. Sounds good! Glad to see the effort still being put into this website. I’ve got one question for you Bjorn, should I drop the cash on a 60th anniversary Les Paul? The thing sounds fantastic but whats your opinion on it? Oh, no! Just when I’ve told my wife I’m immune to any more pedal temptation, you review another great one! Thanks for the usual great review, Bjorn … my wife will never forgive you! Hi Bjorn. Thanks for this review. Just curious: how would you compare this to the BYOC Large Beaver Ram’s Head? Thanks. My first comment here so far (allthough i’ve been checking out your site for a couple of months now :D). I really enjoy gilmourish.com. Your tips helped me a lot to get the tone i desire. Thank you so far! What gilmourish.com score would you give the Buffalo FX Rams Head? Hi Bjorn, I am a huge fan of the Pig Hoof which I use for most of the solo’s right now. Which one do you prefer? Really good demo! How do you compare with BYOC Ram’s Head? Oh dear, that is one tall pedal! Sound very nice though. By the way Bjorn, do plan on updating the Fuzz Buyer’s Gear Guide anytime soon? I’m really looking forward to it. reviews would be cool for a SUF Violet Menace, wren and cuff Box of War, and a Dunlop red band of gypsys fuzzface. Its really an octavia with the octave removed but I really like mine. cleans up so good i gave up on my 109. put a compressor and eq after it and it is awesome.